With New Year’s Eve just a few days away, it’s time to finalize your evening look. Here at Who What Wear, we’re huge advocates for embracing personal style, and it only seems appropriate to ring in 2018 in a chic, personalized fashion. What better way to embrace your individuality than turning to your horoscope? So we pinpointed the NYE dresses that best reflect each zodiac sign. After dissecting the horoscopes, we were pleased with the diverse selection of 2018 NYE dresses. The pieces range from velvet to sequins to silk, covering all of the major trends you’ll spot on NYE. While the designs may vary, each dress perfectly reflects that zodiac sign’s personality, behavior, and style. Interested in what your horoscope has in store? Scroll down to see which NYE dresses are best for your zodiac sign. As a leader, you’re used to thriving in the spotlight. This New Year’s Eve, you’ll want to wear a color as bold and energetic as your personality. The tassel detail adds a chic asymmetrical detail. We’re calling it—velvet will be a huge trend this NYE. As a Taurus, you’re willing to invest in a tasteful dress. Your passionate character shows through these warm golden dresses. Wear this silky gold dress with minimalistic accessories. The metallic hemlines and drapery will catch the light. 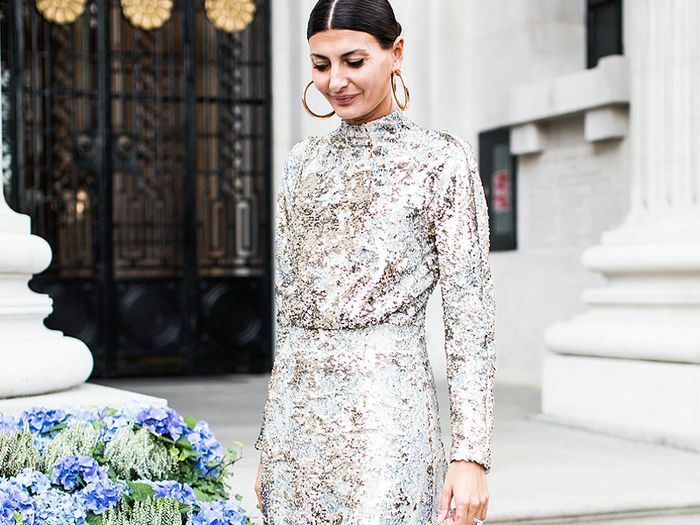 A silver sequin dress is a reflection of a Gemini’s free-spirit. Every New Year’s Eve, your priority is to have fun and be social, so a statement dress is a necessity for you. Wear a red lip with this long-sleeve sequin dress. New Year’s is the night to rock your glitziest dress. While you’re known to be a party animal, you also prioritize emotion and intimacy. A soft velvet dress will ensure a comfortable night. The side slit shows the perfect amount of skin. Style this velvet dress with statement heels. Available in sizes 36 IT to 42 IT. There’s nothing you love more than to be in the spotlight. Channel that positive energy through a metallic-gold look. It is the perfect reflection of your bright, bold outlook on life. Pair this wrap dress with simple gold accessories. Rock a plunging neckline on New Year’s. At holiday events, you try and maintain a humble, chic look. Emerald green is a reflection of your neutral pure intentions. Style this slip dress with flats for work and heels for evening. The ruched detail adds a flattering detail. Libra, you gravitate toward all things classic, despite the ever-changing fashion world. This year, wear a gold dress that cinches at the waist. Pair this velvet wrap dress with gold hoops. Opt for this classic number. Nothing screams Scorpio more than a refined black dress. You like to keep your cocktail attire mysterious and intense. Eighties-inspired sleeves will be huge this New Year. The translucent lace upgrades this black dress. You constantly keep everyone on the edge of their seats. A strong sequin dress will be no surprise to those familiar with your unique outspoken behavior. Disco-inspired clothing is forecasted to make a serious appearance this holiday season. Style this statement dress with simple accessories to draw attention to your look. Available in sizes 6 UK to 16 UK. When it comes to clothing, you're all about versatility. This New Year’s, wear a red dress that can easily be worn on other occasions. Style this dress with a leather jacket and loafers for the daytime. Aquarius women appreciate original style, putting their own personal spin on all their looks. Try a classic black sequin dress with modern detail. A one shoulder detail is sure to make a statement. When it comes to cocktail attire, Pisces prefer a soft romantic look. Wear a pair of drop earrings with a moody velvet dress this New Year’s. Style this soft piece with bold block heels. Now check out the best ways to wear dresses in cold weather.